To give and receive: it’s the essence of Christmas. Strip away the personal significance, though, and we’re really just looking at the process of consumption. This year, as the global recession has bitten deep, it has inevitably changed consumption patterns — with knock-on effects for sustainable development worldwide. Here are some of the stories from 2009, some surprisingly cheering. 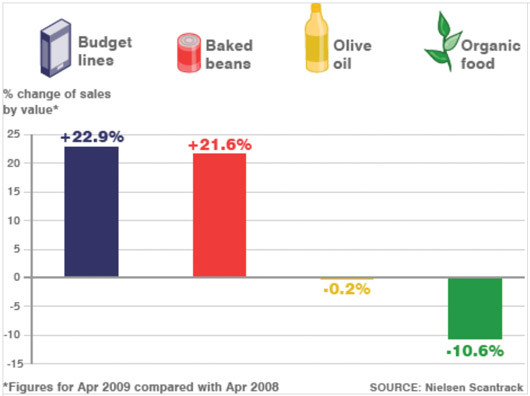 In the UK, cheaper food sold very well this year, increasing by 23 per cent. Goods such as baked beans and potatoes have flourished. Behind these headlines are some positive sustainable development stories too. It has been a bumper year for many producers in developing countries. Ethiopia, for example, exports 30 per cent of its bean harvest, many to European markets. That makes it Ethiopia’s third largest export crop, and one particularly important for small-scale farmers and economic growth. On the flipside, the organic food niche has suffered, which may mean an exit of farmers from the organic sector and potential knock-on effects for the environment. Indeed, Juliette Jowit, in the Guardian, reported earlier this year on the exit of British farmers from organic production. Although evidence is lacking, we expect similar patterns to occur among developing country producers, who often benefit from access to these niche export markets. The recession demonstrates clearly that when times are tough, price is king. Yet encouragingly, large food businesses, which have experienced faltering customer confidence and trust during the recession, have not turned their back on ‘sustainability’. Cadbury’s Dairy Milk – the UK’s leading chocolate bar – is now adorned with the Fairtrade label, which will mean an increase of 25 per cent in UK Fairtrade sales – a positive for Fairtrade growers in Ghana, where the amount of cocoa sold under Fairtrade will triple from around 5000 to 15,000 tonnes a year. With this comes guaranteed minimum prices that provides a safety net for farmers in notoriously volatile commodity markets and allows them to plan ahead with greater financial security and social premiums to invest in healthcare, water and other local community projects. Trading down: eggs instead of meat and fish? Though our purchasing decisions may be more about price and less about ethics and the environment in hard economic times, this does not have to mean the environment inevitably suffers. Shifts in consumption may have unintentionally positive effects for the environment. For example, demand for fish has been argued by the Food and Agricultural Organization of the UN (FAO) to be ’sluggish’ in 2009 compared to 2008. According to the FAO, ’sales are sluggish in all major markets and prices and margins are under pressure for most seafood products’. Meat consumption is also thought be to down in the US – one of the top nations for meat consumption. Eggs sales, on the other hand, have risen significantly since the start of the year, as they are a cheap form of protein and a key ingredient in home-made food. As a result of ‘trading down’ consumers have resuscitated their kitchen stoves in a move away from restaurant and pre-cooked meals. Meat and fish consumption has implications for sustainable development. First, between 12 and 18 per cent of total greenhouse gas emissions are thought to be caused by livestock – through the release of methane and nitrous oxide (which have far higher global warming potential than carbon dioxide) from animals and their waste, and through deforestation to make space for production of livestock and their feed. The raising of livestock also involves significant use (and pollution) of water. Fish stocks have been predicted to collapse completely by 2046, in research carried out by Boris Worm and others in 2006. Ewen Callaway writing in the New Scientist reports that there is some initial evidence that commercial fish stocks are recovering, although 63 per cent of world fish stocks are still found to be at unsustainable levels, particularly in the developing world (which produces 80 per cent of the world’s fish). Though the partial recovery in some stocks has been argued to be due to effective ‘conservation measures’, the economic crisis may well give these efforts an added boost. Sales of ‘local’ produce from supermarkets have also risen. Asda, a leading supermarket in the UK and now part of the Walmart empire, claims its sales of local produce are up 55 per cent compared to last year. Asda argues that consumers are doing this because of environmental concerns over ‘food miles’, and also as a bid to support local businesses in time of increased job and financial insecurity. Retailers, possibly as a strategy to regain consumer trust but also to make money from this growing trend, have also turned their focus towards sourcing locally. Blogger Douglas Fraser explains that at the Scottish Parliament earlier this year, Asda stated it was increasing in sourcing from Scottish producers, up from £16 million last year towards a target of £25 million this year. What does the trend towards local mean for the livelihoods of small farmers in parts of the developing world? It might be too early to tell, but monitoring these trends will be vital to ensure the net impact of the recession is not a negative one, particularly for producers in the developing world. Dispelling misconceptions about food miles might be one example of ensuring that our growing preference towards local produce does not have unwanted and unforeseen effects. Consumption is one of the most powerful ways in which we shape the lives of others. Christmas is as good a time as any to try and ensure the choices we make have positive outcomes.